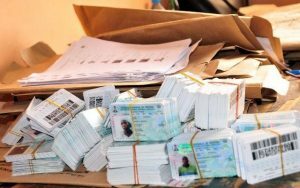 The Independent National Electoral Commission (lNEC), on Tuesday, said 304,852 registered voters were yet to claim their Permanent Voters’ Cards (PVCs) in Kwara State few days to the general election. INEC Resident Electoral Commissioner (REC) in the state, Alhaji Attaihiru Madami, disclosed this in Ilorin during an interview with our correspondent. Madami said the unclaimed PVCs were part of the 1. 4 million printed for voters registered during the Continuous Voter Registration (CVR) across the 16 Local Government Areas (LGAs) of the state. He said INEC was doing everything possible to ensure that the PVCs were collected on or before the Feb. 8, deadline for their collections.